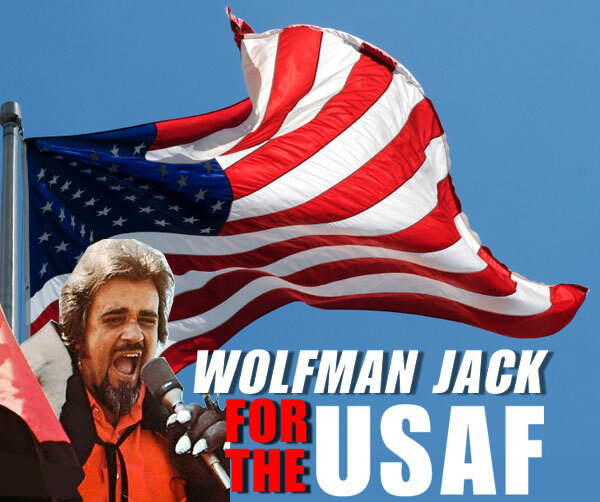 Our thanks to David Browder for his contribution of The United States Air Force Presents Wolfman Jack!
. . . I think she gets that way from smokin' old album covers . . .
"The United States Air Force Presents Wolfman Jack" was distributed on vinyl in the 1970s and was intended to be used by radio stations to fill unsold time and qualify as "public service" programming. Here, we've combined two 25-minute shows from December, 1977. The show was produced in Los Angeles by Roger Carroll. These 1977 shows include an updated introduction and closing theme. The second show closes with a classic oldie performed by the Wolfman.